Rubiaceae, the Madder or Bedstraw family houses well known genera such as the Gardenias & Coffea (coffee). It is also home to many lesser known groups like the Ant Plants. Let's take a look at these curious epiphytes & some other plants around the world that make natural dwellings for ants. Ants are not a bad thing to have around the garden. They are tireless foragers, cleaning up organic material & hunting pests like slugs & caterpillars. Like bees, they can help plants reproduce as they wander in search of food & in turn, they represent a meal to other garden fauna such as birds & lizards. A nice way of giving ants a chance is growing myrmecophytic plants. The term myrmecophyte refers to a plant that lives in a symbiotic relationship with ants. This type of behaviour is exhibited by species from a number of different plant families, many of which are also epiphytes or lithophytes. 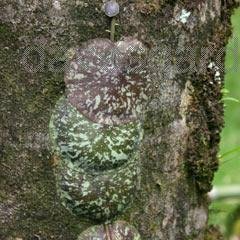 In other words, many myrmecophytes live in the nooks of trees or on rocks & rely partly or wholly on ants for their nutritional intake. Such plants include certain bromeliads, some orchids & ferns, members of the Hoya family & Ant Plants. Ant Plants represent five related genera of epiphytes or lithophytes endemic to south-east Asia & Australasia: Myrmecodia, Hydnophytum, Myrmephytum, Anthorrhiza & Squamellaria. These plants are bulbous & tropical, preferring shade & steady watering. As they grow, they develop an internal network of tunnels & chambers known as a domatium. These are great homes for ants, who naturally oblige by using these plants to settle colonies. Two species of Ant Plant found in the mangroves forests of northern Australia have been brought into cultivation. These are Myrmecodia beccarii, the Prickly Ant Plant & Hydnophytum moseleyanum, the Smooth Ant Plant. Both these plants feature dark, waxy leaves similar to their Gardenia cousins & a fat caudex which will usually - though not exclusively - house Acrobat Ants (Crematogaster sp.) . Amazingly, these plants maintain ideal internal conditions in terms of temperature & humidity for their symbiotic partners. The waste left by the ants feeds the plant, which is also protected by its own formicidaen garrison. Handling one of these caudiforms will normally prove a memorable, but regrettable experience. By the same token, placing Ant Plants strategically in your garden will afford a measure of natural protection from pests & help keep it tidy. Caularthron is a family of four bulbous epiphytes endemic to the Amazon. This genus features a prized ornamental in C. bicornutum, the Virgin Orchid & at least one mymecophyte. Like its Rubiaceaen counterparts, C. bilamellatum, the Little Virgin Orchid shelters ants in its bulbous base. The waste produced by the ants is digested by the plant through its leaves. 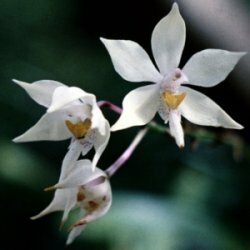 These orchids are difficult to obtain & highly sought after by collectors. Caularthrons prefer dry conditions & can be grown suspended in a variety of ways or potted in a permeable medium. At least three bromeliad genera include myrmecophytic species. Some of these house ants & others form part of a larger ant colony & garden complex. 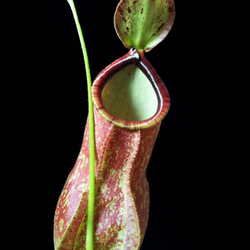 One is also carnivorous, trapping insects with its leaves in similar fashion to pitcher plants. The Brocchinia family is closely related to Tillandias. It includes two South American myrmecophytes, one of which is carnivorous. The pure myrmecophyte is B. acuminata, an obscure bromeliad with no common name. 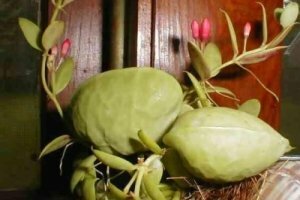 In terms of bulbous leaf structure, it is similar to the myrmecophytic Air Plants. 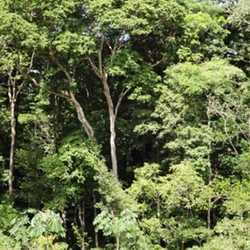 Its leaves are capable of absorbing amino acids, as are the roots it sends up into its leafy domatium. 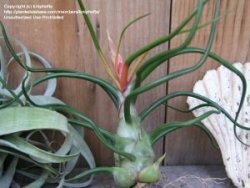 The third genus is Aechmea, probably the largest of the bromeliad families. Its ant-housing representative is A. brevicollis, yet another obscure plant. 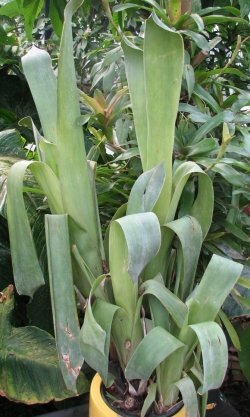 Like most of its myrmecophytic relatives, it features leaves that channel water away rather than collecting it in a tank. This file is licensed under the Creative Commons Attribution 2.0 licence. No less unique than Brocchinia reducta is Nepenthes bicalcarata. This species belongs to a family of over 100 carnivorous vines appearing across tropical Asia from New Caledonia to Madagascar. 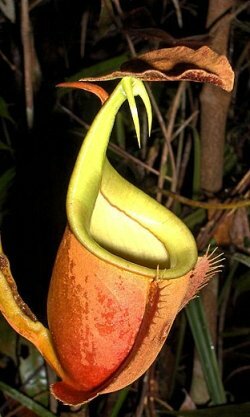 Nepenthes species are also known as Tropical Pitcher Plants or Monkey Cups. Their leaf-traps - which monkeys are known to drink from - are very similar to those grown by Drosera species. These collect rainwater & insect prey, which partly sustain the vine. "Hauling food from the pitcher fluid to the peristome, a distance of no more than 5 cm, may take up to 12 hours. In this way the contents of N. bicalcarata pitchers is controlled such that organic matter does not accumulate to the point of putrefaction (sic)". Dischidia is a smaller, related genus, featuring around 80 arboreal epiphytes from tropical China & south Asia. Most of these live in association with ant nests & have leaves modified to either accomodate ants or provide storage space for them. Some species develop hollow, root-filled leaves, whilst others are shingle plants much like H. imbricata. The leaf modifications seen amongst these plants can be quite complex; featuring foliage folded, fused & atrophied in various ways to form simple hollows through to roomy chambers. In the leaves of some species such as D. pectenoides, there are even inner-chambers formed by folded leaf-tips. These ant plants are not well known but there are a few species in cultivation. Lastly, there are two genera of ferns that include myrmecophytic species. Solanopteris, the Potato Fern family are a group of rare epiphytes from tropical America. 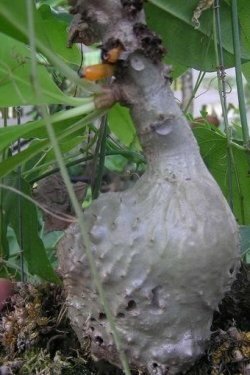 These ferns develop hollow tubers from their rhizomes, which ants are known to colonise. These tubers are often hollowed-out further by the nesting ants. It is not yet clear how or to what degree this relationship benefits the fern, but logic suggests that it gains some advantage. Looking at it overall, the world of myrmecophytes is a wierd & wonderful one. As we have seen, many of these plants are barely studied, as if researchers have been reluctant to approach them. Many of them - such as the Caularthrons - are also quite beautiful. Whilst a resident ant colony would not suit every garden or gardener, there are many situations which one would. Most ants are neither invasive nor aggressive, but more inclined to go about their own business. 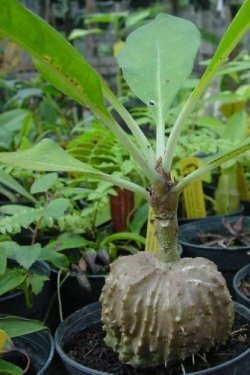 Placed thoughtfully, a myrmecophytic plant can be a vital part of a naturally healthy garden. A life-long vegetarian, community gardener & member of Australia's SeedSavers network. I love plants both within the garden & in the wild. Trees are a special passion that I hope will prove infectious.